Patients with fused low backs or who have metal screws or plates in their spines should not have Spinal Decompression Therapy. Extreme caution should be used with patients with advanced osteoporosis. Patients receiving Spinal Decompression Therapy may experience some discomfort in their back area following the therapy. Which may last up to 24 hours. This is a normal part of Spinal Decompression Therapy. Spinal Decompression Therapy is designed for the rehabilitation of the spinal disc. Patients with the following diagnosis and/or symptoms may be candidates for Spinal Decompression Therapy. The recommended program for disc rehabilitation can vary from patient to patient, depending on the severity of the disc problem. Most patients begin to experience relief within the first five sessions. After the fifth decompression visit, patient treatment is re-evaluated to determine how many, if any, decompressions are necessary. 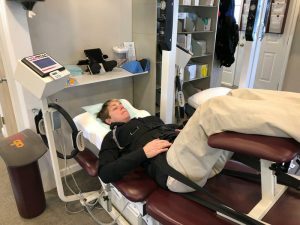 Candidates for Spinal Decompression Therapy are first given the opportunity to experience the minimal constraints of the procedure prior to making any decision to starting the procedure. It is recommended that patients with chronic conditions such as Degenerative Disc Disease and/or Spinal Stenosis stay on a maintenance decompression program of once a week to once a month depending on the severity. There are many different types of Spinal Decompression Systems. All successfully create a negative gravity at the disc level. The most well-known is the DRX9000. However, with some of the newer and more sophisticated tables, patients can now be treated facing upward or downward while incorporating 54 table positions. In addition, the 3D Active Track used here in our office, is one of the few systems that will allow the Doctor or therapist to be interactive during the Decompression Therapy. These newer advancements have increased the probability of success with some of our more challenging patients. Patients with fused low backs or who have metal screws or plates in their spines should not have Spinal Decompression Therapy. Extreme caution should be used with patients with advanced osteoporosis. Patients receiving Spinal Decompression Therapy may experience some discomfort in their back area following the therapy. This may last up to 24 hours. This is a normal part of Spinal Decompression Therapy. Cervical Spinal Decompression is a sophisticated form of computerized traction specifically for neck disc disorders. Similar to lumbar decompression, cervical decompression takes pressure off the spinal discs, which are gel-like cushions between the bones in your spine, by creating negative pressure in the disc. As a result, bulging or herniated discs may retract, taking pressure off nerves and other structures in your spine. This in turn helps promote movement of water, oxygen, and nutrient-rich fluids into the discs so they can heal. It is extremely effective in the treatment of neck and arm pain caused by disc herniation and/or disc degeneration. Treatment time for the cervical and lumbar decompression can range from 10 to 20 minutes.